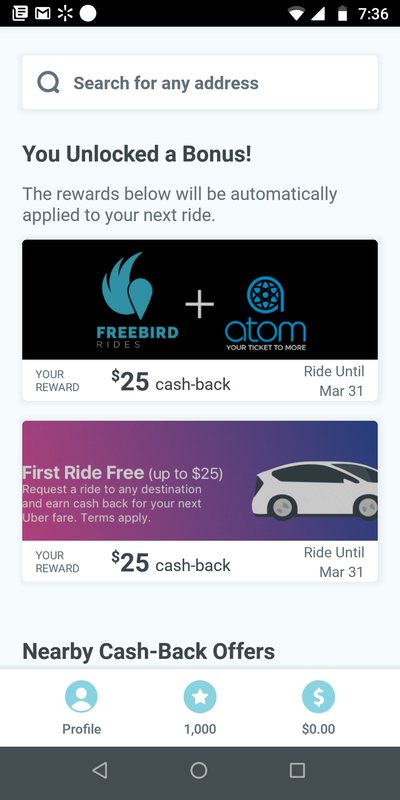 Freebird (app that gives you Uber credit/cash back for completing specific actions/visiting retailers etc) is offering an additional $25 back when you use promo code ATOMVIP. Remember the code needs to be added on Freebird, not Uber. This in addition to the $35 you can already get for signing up and using a referral code. This new $25 code should work for existing users. I think you have to use it to go to the movies, but I’m not 100% sure on that. I’m guessing you tried to add it to Uber and not Freebird. Definitely not expired. Working for me added. Will reply back later when I use to see if it works everywhere. No it’s still good as of 4:30pm pst. I signed up and added the code but don’t totally understand the deal. Do we just take any ride using the Freebird app and then we get $25 uber credit? I also used a referral, so I’ll also get $5 credit for each of my next 2 rides, but I’m not sure if the $25 credits (one for ATOMVIP, another for FREERIDE) would apply first, or if those $5 will apply first. As in, I should have 4 credits (two $5 & two $25), but in what order? I just added it as an existing user that also got the $35 for signing up and using it for the first time. I’ve made about $150 since signing up when it was first mentioned on here. Once added, it shows an expiration of 3/31. Doesn’t say that you have to actually go to a theater, but we will see. For me, $0.28 IMAX ticket for Glass tomorrow using Atom tickets promo. Just $5 discount, though, but used Facebook to find theaters, so convenience fee was also waived off. Do you know how will these credits apply? As in, can any of the 4 credits (two $5, two $25) stack together? Even if they won’t, in what order would they be applied? From what I have seen, one actual promo per ride is applied. The highest one applied for me but I can’t say for certain that they didn’t apply in the order entered. I can say that their support and customer service have been great when I reached out, and I would be surprised if they didn’t honor the highest applicable offer first. For me, it shows that two $25 credits will be used for my next ride. I hope it would only use one, though. Thanks Doc . Still working at 8:30 PM EST . How do you add a card to Freebird when you are an authorized user on that card? Guys, it is only gives you cash back of the amount of the ride not the entire amount. Data point as a new user – started by adding a referral code, ATOMVIP, and FREERIDE. Took my first ride (a ride worth $22) and code ATOMVIP was applied, now showing $25 cash in my cash balance. $5 referral cash also appeared after first ride. is your ride to a movie theatre or any other location? Used this code about a month ago and it worked on a trip to a grocery store that was nowhere near a movie theatre so it should work anywhere as I’ve been telling my referrals. William Charles Chuck Confirmed ride can be anywhere. Received CB instantly. Might be worth updating post. You are correct to maximize get as close to $25. Then the cashback is immediately available to Cashout. There is also a points system from different promos and each ride earns 250 or 100 that accumulate to $10 cashback. 3. put in referral code?